In case you needed another reason to get pumped about Friday, you'll be happy to know that Starbucks is treating everyone to an extra special sendoff into the weekend this week. That's because the coffee mega-chain is hosting a happy hour on the afternoon of Friday, June 29 with a buy one get one free (BOGO) offer on all Frappuccinos. 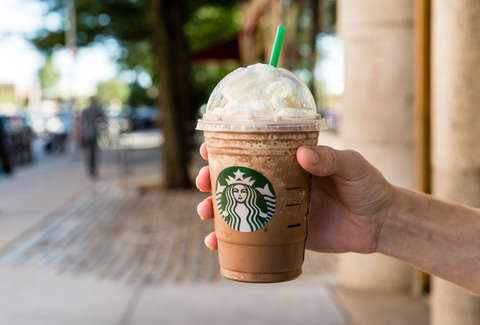 The deal, which is part of the chain's recently revived Happy Hour promotion, is good for a free grande or venti Frappuccino on the menu when you purchase one of the same at regular price. To get in on the offer, all you have to do is sign up for Starbucks Rewards -- if you aren't already -- and snag the promo code to flash the barista. Then show up to your nearest Starbucks between 3pm and close, and snag your double dose of caffeine. As for what kind of Frappuccinos are up for grabs, you've got your pick of pretty much anything on the menu, including the new Ultra Caramel and Triple Mocha versions of the beloved blended beverage.